It is really quite easy to get used to eating dessert. After a few weeks of gelatos in Italy, then a few summer BBQs with pies of all sorts, and then custard from our favorite shop in Alexandria (Dairy Godmother), my sweet tooth begins to get lonely when it is not given its now expected attention. So there I was two evenings ago, sitting at home really craving dessert. And I had no excuse at all to leave the house to get some. So...I decided to take matters into my own hands and bake dessert. 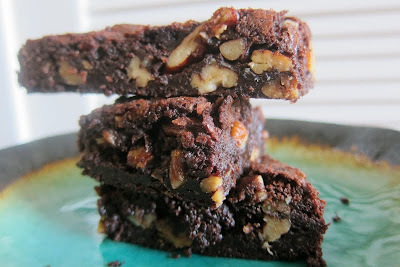 I decided to try a new recipe for dense fudgy, flourless brownies. Just to tell you how it ends,...they were probably the best brownies I have ever tasted. The recipe does not call for too many ingredients, which is why you can usually make them without having to run out to the store to get those few missing items--and then potentially be blindsided by the ice cream aisle...only to have your intentions to bake become ruined. Not that it has ever happened to me. 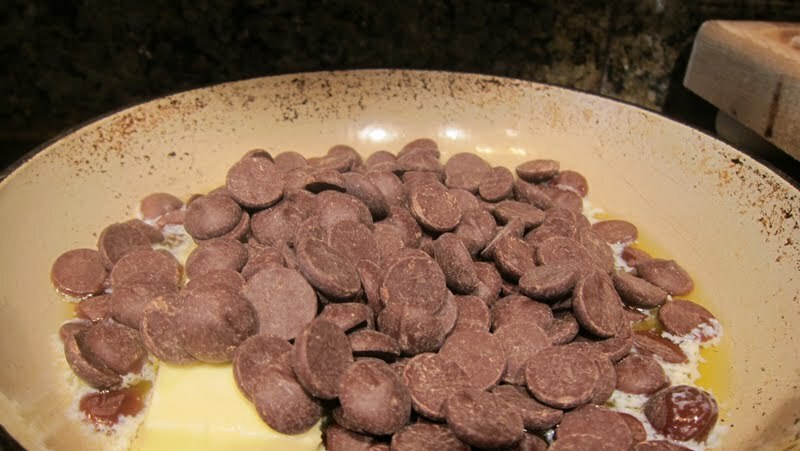 First I melted the butter, salt, and the chocolate on very low heat on the stove. It really makes a difference here, what quality of chocolate that you choose to use. Since there are so few other ingredients, you will really be able to taste the flavor of the chocolate in the final product. I picked a higher-end brand that makes bittersweet chips, but you should buy a few different kinds and taste test for yourself. Of course you do not want to burn the chocolate, so you must stir often and remove it from the heat before it is totally melted. Blend the cocoa and cornstarch together in its own bowl, and put aside. Then into the cooled chocolate mixture, beat in the sugar and one egg at a time. 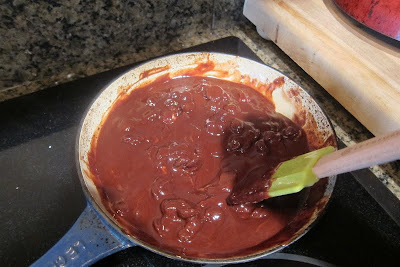 Next add the cocoa and cornstarch. Now...the very important part is to beat the batter vigorously for at least 1 full minute, until it becomes smooth (less grainy). I don't recommend doing it by hand, unless you enjoy the burning sensation in your bicep and forearm. 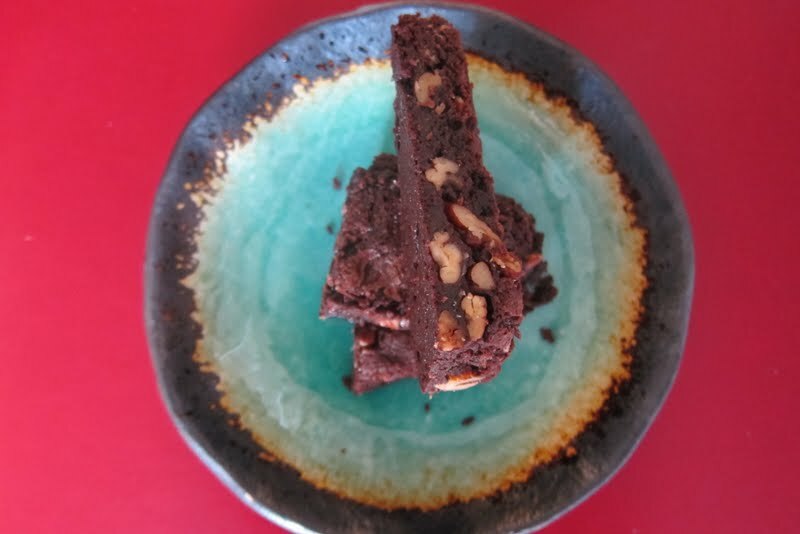 Warning: if you do not do this, you will have a crumbly brownie topping for your ice cream, rather than moist fudgy brownies underneath your ice cream (although either way it really tastes delicious). Once mixed well, gently stir in the toasted nuts. I chose pecans since Brian's Southern background forces him to love them. 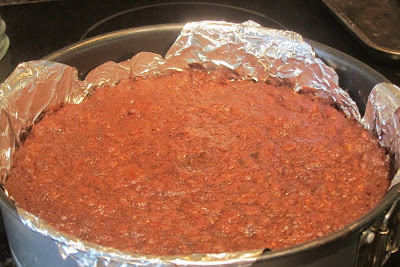 I then spread the batter on a foil covered pan and baked it for about 20 min at 350, just until set. Do not over bake- again potential for them to get crumbly and dry. After a bit of cooling, the first cut revealed success. 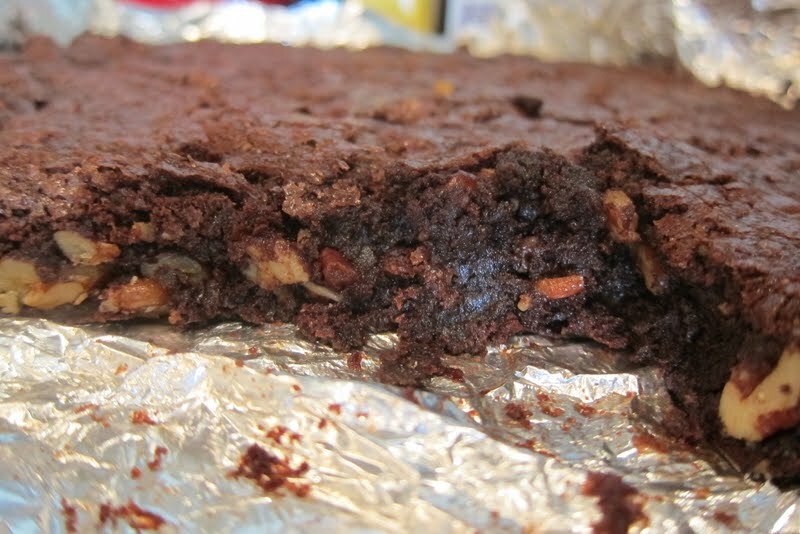 Thick, solid, moist and chocolaty. The smell was heavenly- of butter and rich cocoa. And so, as Brian scooped a spoonful of warm brownie dripping with melted rich vanilla ice cream, into his mouth, he said,..."and this is how I am going to get fat". I explained, "Just because these taste so rich and delicious, you expect it to mean that they are worse for you than some other dessert that you would normally buy at the store, which does not taste as good. When in fact... it is just the simple recipe and high quality ingredients (chocolate, cocoa, pecans) that make these so tantalizing ...well, and a little love...just a little though.